[description] => In a crytic tweet , Arvind took a shot at GVM’s ‘grow a pair’ remark which was aimed at Karthick Naren. [articleBody] => Noted filmmaker Gautham Vasudev Menon found himself in the news for all the wrong reasons, yesterday, when he got into a spat with young director Karthick Naren. It began when Karthick Naren sent out a Tweet about how he was cheated by someone he trusted blindly. Following this GVM sent out a tweet about how some young filmmakers need to ‘grow a pair’. Reacting to this the young filmmaker accused him of using funds meant for his Naragasooran to complete his own directorial ventures. “When I signed Naragasooran for Gautham Menon sir, everyone asked to reconsider my decision. But I had immense faith and admiration in Gautham sir and we started the shoot. While everybody advised against it I had the pair to trust you & collaborate sir. In return we were treated like trash & made to invest on our own. I think its better to whine & confront instead of running away. Please don’t do this to any other young filmmaker sir. It hurts!“ he added. In a separate interview with Sify, he also said that GVM had failed to clear Arvind Swami’s dues and criticised him for mishandling his funds. “Though Gautham sir’s Ondraga banner is associated with Naragasooran on paper, he hasn’t invested anything into our project. What really hurt me is that he has gone ahead and borrowed money pledging my film (Naragasooran) and invested in his own films —Dhruva Natchathiram and Enai Noki Paayum Thota. The main issue now is that Gautham sir has to settle the remuneration of Arvind Swami sir and other actors,” he added. A short while after GVM and Karthick Naren’s heated exchange, Arvind sent out a tweet which many feel is a dig at the Ye Maya Chesave director. In his tweet, he said all of us can ‘grow a few things’. “Yes we all can grow a few things, a pair of eyes that sees what we do to others , a pair of ears to hear the truth, a conscience to tell us when we are wrong and a pair of whatever to accept our mistakes and apologise...instead we grow our list of commitments that we can’t keep,” he added. 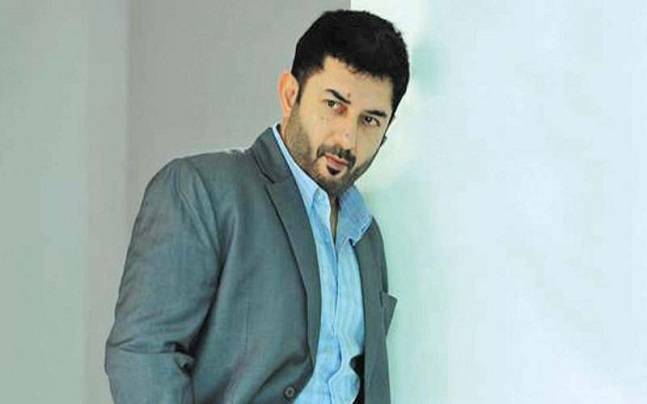 In case you did not know, Naragasooran is an adventure-thriller and will see Arvind act opposite Shriya Saran. It also has ‘bilingual hero’ Sundeep Kishan and Indrajith in key roles. In a crytic tweet , Arvind took a shot at GVM’s ‘grow a pair’ remark which was aimed at Karthick Naren. Noted filmmaker Gautham Vasudev Menon found himself in the news for all the wrong reasons, yesterday, when he got into a spat with young director Karthick Naren. It began when Karthick Naren sent out a Tweet about how he was cheated by someone he trusted blindly. Following this GVM sent out a tweet about how some young filmmakers need to ‘grow a pair’. Reacting to this the young filmmaker accused him of using funds meant for his Naragasooran to complete his own directorial ventures. “Yes we all can grow a few things, a pair of eyes that sees what we do to others , a pair of ears to hear the truth, a conscience to tell us when we are wrong and a pair of whatever to accept our mistakes and apologise…instead we grow our list of commitments that we can’t keep,” he added.